I did accomplish one thing I wanted to do today. 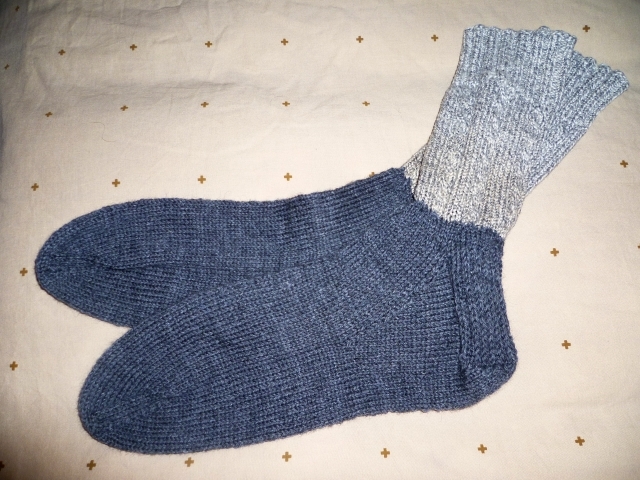 I finished John’s recycled socks! Now, I can concentrate on the Metalouse shawl. Done, done, and done! The details? I used 4-ply Patons Kroy on 2.5 mm dpns. The original sock was knitted on 60 stitches; I cut off the foot, picked up the stitches and worked my way back down the foot. As a result, John doesn’t have any extra socks to wear but I did give a pair of worn out socks a new lease on life. These would be the perfect wedding socks… “something old, something new”. I know, I’m getting silly. Almost time for bed! Before I head for bed, though, I do have another small project to share with you. I must tell you in advance, though, I really don’t like hand sewing! 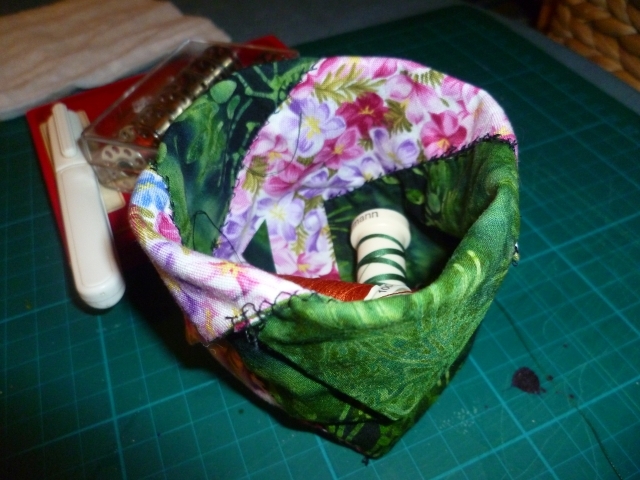 This is a thread holder, especially for those times you’re doing some sewing (with your sewing machine!) and you need a place to toss all those little bits of thread (the spools are in there only for photography purposes; they’re not being disposed of) that accumulate. The final seams, the ones that look so messy, really should have been hand sewn. I did 3/4 of one seam and was thoroughly frustrated so I did the rest by machine. It is kind of cute, though. And it’s another finished item!